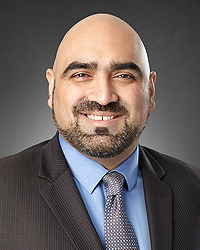 Faisal Khan, MD, specializes in invasive and non-invasive Cardiology. He received his medical degree from Aga Khan University Medical College in Pakistan. Dr. Khan is board certified in Internal Medicine and Cardiovascular Diseases. He completed his Internal Medicine Residency and Cardiovascular Disease Fellowship at the University of Cincinnati Medical Center, where he was elected by the faculty to serve as Chief Fellow. Dr. Khan has also been recognized by his peers as a "Top Doctor" in Cincinnati Magazine for four consecutive years. He is a Fellow of the American College of Cardiology and a Registered Physician in Vascular Interpretation. In his spare time, Dr. Khan enjoys travel, movies, reading and spending time with his wife and two young daughters.